At Archie McPhee's you can find a wonderdful Christmas wrapping idea: Bacon Gift Wrap! His site says: Let's face it, mainstream gift wrap has lost its edge. More often than not, you end up wrapping your gift in yesterday's comics and that's just unacceptable. Start wrapping in style! Our line of exciting gift wrap features unique artwork sure to make your present stand out among the crowd. You'll get four 20" x 30" sheets of quality wrapping paper. 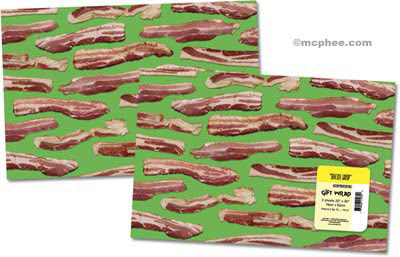 Bacon Gift Wrap, Set of 2item 11034$7.95 ea. And what gift to wrap in Bacon Gift Wrap? 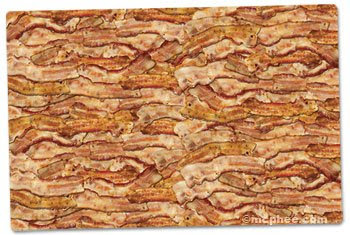 Why Bacon Placemats, of course!